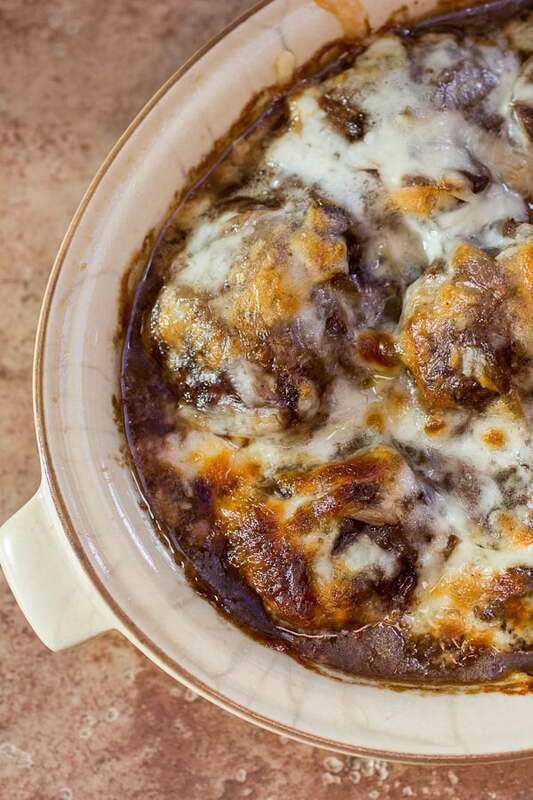 French Onion Stuffed Meatballs are the ULTIMATE comfort food. 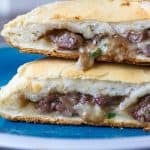 Combining the best of so many worlds with super-flavorful caramelized onions, tender, juicy meatballs, and lots of gooey cheese – these are SO worth the work. 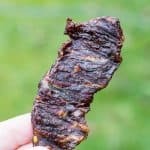 Now that the weather is turning a bit, I can finally share with you guys one of the BEST blogger recipes I have ever tried. Hands down. Brianne from Cupcakes & Kale Chips – this is amazing. It is unique, creative, and so satisfying and delicious. I made quite a few changes based on the ingredients I had on hand, and my inability to ever follow a recipe exactly as written. It is a sickness. I just can’t do it. Can I Cook Meatballs in a Slow Cooker? 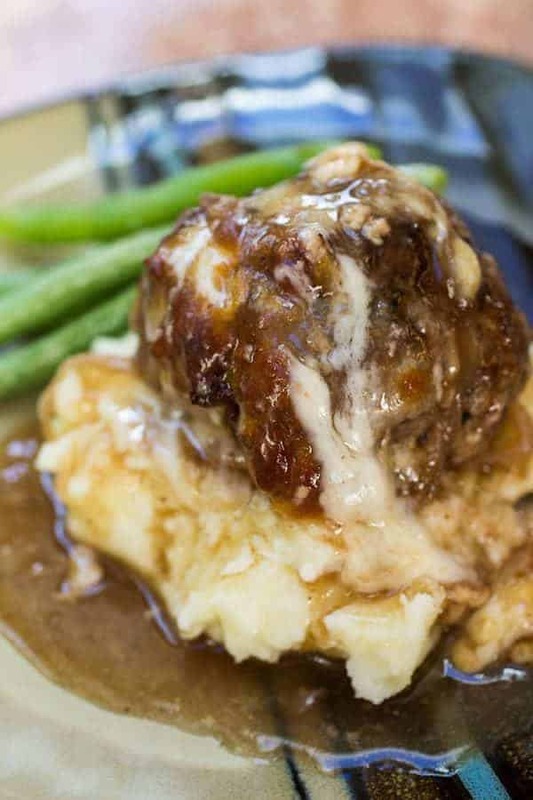 These french onion stuffed meatballs would be easily adapted to a slow cooker. Just toss the browned meatballs into a crockpot, top as instructed, and cook on low for 2-3 hours or high for 1-2 hours. 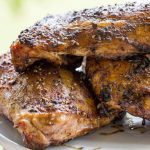 Adjust the cooking times for your personal slow cooker as needed. 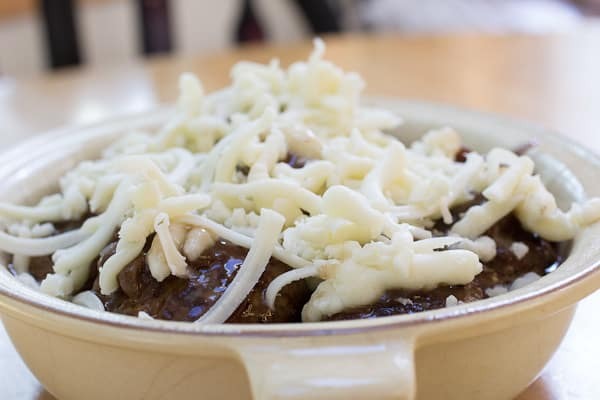 You probably will miss out on a bit of the cheese browning that you would get in the oven, but if your slow cooker stoneware allows for it you can finish these in the oven. 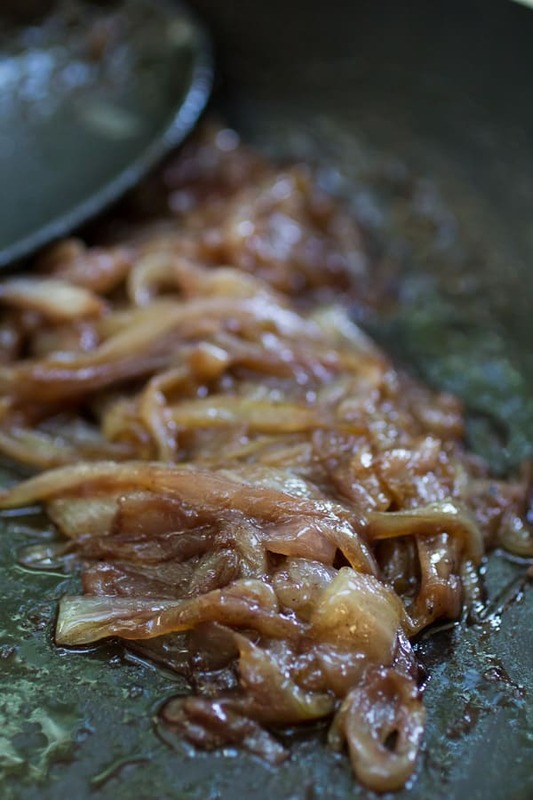 See my post on caramelizing onions if you aren’t familiar with the process. Can I make this without stuffing the meatballs? If you find yourself a little short on time you could definitely skip the stuffing part, and just put all the onions and cheese on top of the meatballs. Almost the same effect. 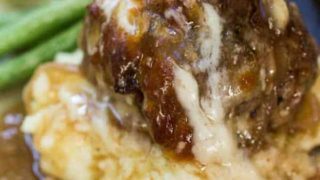 You won’t get to cut open a meatball and have delicious cheese ooze out, but the flavors will still all be there. This is also helpful if you have any onion haters in your family. Need another great meatball recipe? Check out these Traeger Smoked Meatballs, my Smoked Meatball Rigatoni, or my Meatball Subs! 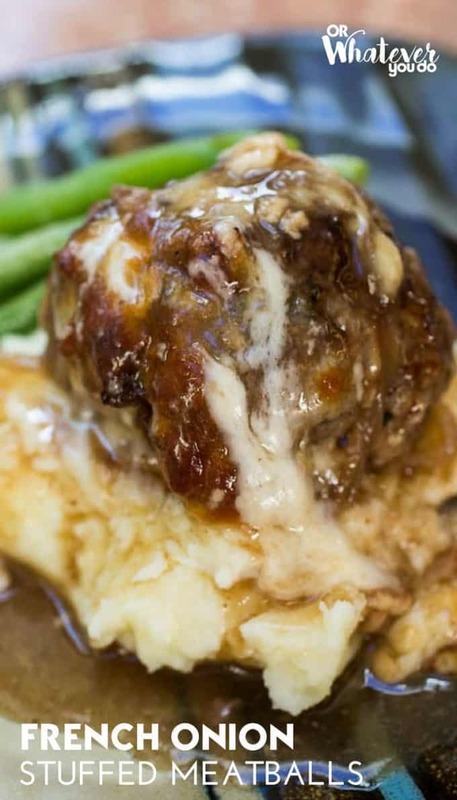 These meatballs are perfect for a big pile of garlic mashed potatoes. You could also serve these with egg noodles as well, or all on their own if you aren’t into mashed potatoes. But if you aren’t into mashed potatoes we can’t be friends anymore, mmmmkay? You also may like my Caramel Roll Cinnamon Cake, or my Raspberry Angel Food Cake to serve as dessert after this meal! Cheesy stuffed meatballs baked and loaded with caramelized onions. 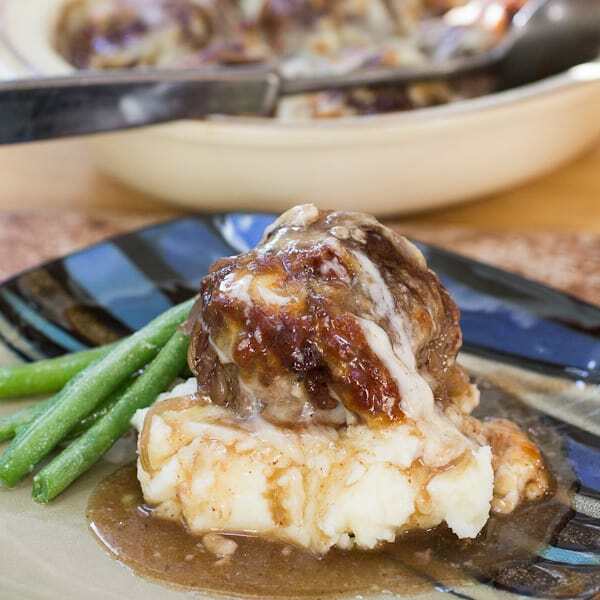 French Onion Stuffed Meatballs are the ultimate fall and winter comfort food! In a large nonstick pan over medium-low heat, saute onions and butter stirring occasionally until golden brown and caramelized. Add the thyme, salt, water, bouillon, and wine. Cook over medium heat until reduced by half. Let cool. Combine the milk soaked bread, 1/2 cup panko, parsley, pepper, salt, and egg in a bowl and mix together until everything is a happy gloopy mess. Mix in the ground beef with your hands until the gloopy mess is evenly distributed into the meat. If necessary to make the meat formable, mix in additional 1/4 cup of panko. Grab a small handful of the meat and flatten in your palm. Add some cheese and onions, and fold meat over and around it, sealing the edges as best as you can. This is a messy process. Repeat until all meat has been stuffed. In a large nonstick skillet, heat canola oil over medium high heat. Brown meatballs on all sides. 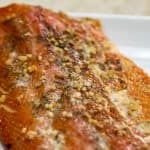 Remove to an oven safe dish when browned. Don't worry about these cooking all the way through. They will finish cooking in the oven. Make sauce by combining all ingredients in a saucepan, and simmering for 10 minutes. Pour over meatballs, and top the meatballs with any extra onions, with the shredded mozzarella cheese, and any extra provolone you didn't use to stuff the meatballs. Bake at 350 for 30 minutes, Remove, top with fresh chopped parsley, and serve with mashed potatoes. Recipe adapted from Cupcakes & Kale Chips. I love Brianne too!! 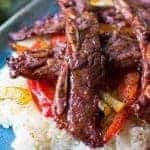 I remember eyeing this recipe when she posted it. I need to make them!! These are calling to my stomach! Perfect comfort food! Holy Moly Nicole! These meatballs are crazy! So much love for this food. P.S. Don’t be surprised when I show up for dinner. Thanks, Heather! It is probably a good thing we aren’t neighbors. Nothing but trouble (and fun) could come from that! This reminds me of one of my favorite dishes at a restaurant, yumm!! Thanks, Beth! We really really liked this one. Definitely going to be a repeat over here. These look fabulous and easy! I’m sure even my kids wouldn’t mind the onions in here. Yum! Thanks, Laura! My kids didn’t even notice, and they are onion haters! This looks amazing. Do you have any non-alcoholic ingredient suggestions for the wine? I’ve had success substituting apple cider vinegar for wine in some dishes. I haven’t tried it with this one, but I bet it would work great! I’m so glad that your gluten-free version turned out so great! And thank you for taking the time to stop by and let me know. Hope you had a great weekend! That’s it, you’re a genius! My favorite food with my favorite soup!!! Ha! Brianne is the real genius, but I’m happy to have made a decent version to share with the world. 🙂 These are really so – so – SO good. I need to make another batch soon! 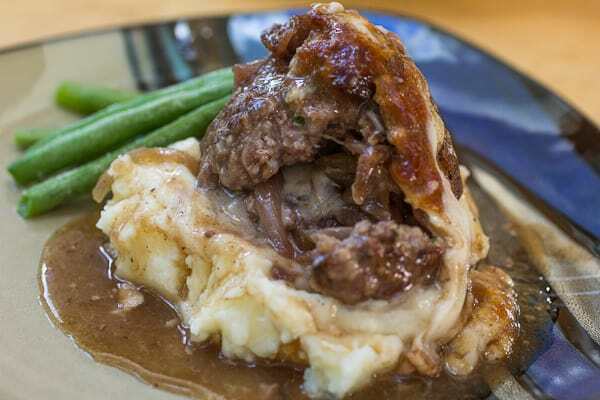 I think I’m going to try it next time in meatloaf form to save some time/energy. They are a little fussy to put together. these meatballs look so scrumptious! Pinning! Oh wow! My kind of meatball! I am really loving the addition of stuffing them with these gorgeous onions – fab! Thanks! We really loved them! I love french onion anything. And the fact that you’ve gone and stuffed it into meatballs kid of blows my mind. Caramelized onions can make almost anything instantly better. I’m totally with ya! I’d love to try these, but we don’t have any wine. I don’t want to buy some just to cook with because, we don’t drink. Are there any substitutes that can be used? 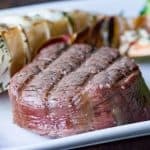 Do you cook these in the oven covered or uncovered? Great recipe can’t wait to try it out. I baked them uncovered, but if they start getting too brown feel free to tent some tin foil over the top. Just make sure if it is going to touch the cheese at all that its either non-stick foil or that you give it a super generous spray of cooking spray. it looks delicious….but the problem is not finding the onion soup envelops..its been missing for a while.. They were to die for. What a fantastic recipe. I didn’t stuff the meatballs, but this recipe was such a hit with my family, even my fussy granddaughter. Thank you. Wow! Thanks so much for coming back to let me know, Ninette! We LOVE these also. So glad to hear they were a hit with your family! 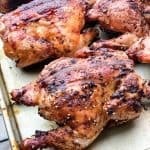 I was interested in this recipe when I found it on Pinterest, but gave up after scrolling through 2 miles of pointless typing. It would have been great to see an ingredient list, and simple instructions. You can find those at the end of the post. Or you can go figure it out yourself someone else. 😀 I’m cool with either option. 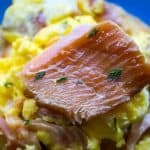 There are lots of other recipes out there! If you can find other awesome ones that don’t make you go through all of that hard work of scrolling, I wish you all the best. Have a great day! You sound like a fun dude! sauteed mushrooms…sooo good! Thanks for the recipe! It adapted very well! Yay! Thanks so much for stopping by to let me know. I’m so glad you enjoyed them! I’ve never had them with ground chicken before. Glad it translated well!